For the second year in a row Flat Bonnie is teaming up with Leecifer to release an adorable Honoo plush! 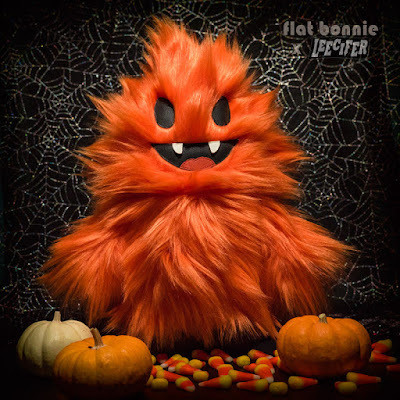 Based on the popular Super7 soft Japanese vinyl figure, the Designer Con 2016 Exclusive Honoo Plush features a Halloween inspired orange and black color scheme. This 15” tall handmade plush comes with a numbered sewn-in tag and is made of faux fur and vinyl pleather (all animal friendly materials). Fans can pick up this awesome release at either Leecifer’s DCon booth #525 or Flat Bonnie’s DCon booth #317 for $75.